In our previous post we created the models for our Northwind Cafe application. In this blog we will create the DbContext class which is the conduit between your entity classes and the database. Think of it as a bridge that the database and the entity framework has to cross to get to each other. Make sure you import the namespace Microsoft.EntityFrameworkCore. I will go over the code above line by line. 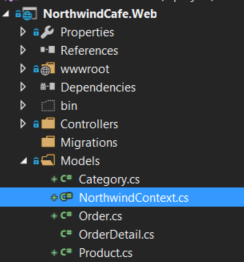 The NorthwindContext constructor tells .NET to pass the DbContextOptions to the base class. We need this because we will add the NorthwindContext in the Startup.cs class in another post. The DbSet represents the tables and entities that will be created for this context. That's about it, the few posts will go over how to add the NorthwindContext to our application and create our new Northwind database from scratch.